If you love waterfalls (and who doesn't?) 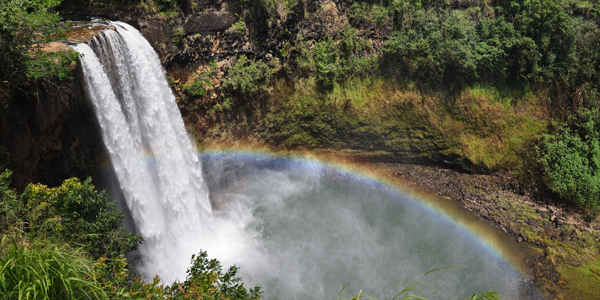 and you're on Kauai then your itinerary should include the Garden Island's most popular waterfall, Wailua Falls. Don't miss out! Although the amount of recent rainfall determines the strength of flow it is spectacular to see throughout the year. The waterfall itself plunges 80 feet into a 30 foot deep pool below. There is a small parking lot just beyond the scenic viewing area, which tends to be busier toward the afternoon portion of the day. As a side note, you may see people at the bottom of the falls while you are there, however, be aware that the hiking trails leading to those spots are very treacherous have been officially closed. It's best to enjoy the view from above.